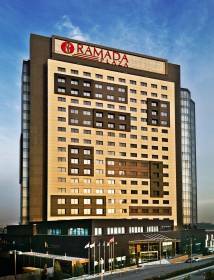 Ramada Plaza İstanbul Tekstilkent Hotel is business type hotel that is located close to Ataturk International Airport. The Hotel has 8 well equipped meeting rooms which offers flexible and intimate atmosphere to facilitate productive and memorable meetings and events. Our 322 bedrooms which have all been furbished are specifically designed to suit the requirements of the modern hotel guest with comfort and convenience in mind. Ramada Plaza İstanbul Tekstilkent Hotel has 273 Deluxe rooms with 32 m2, 3 Handicap, 16 Corner Suit rooms with 60 m2 and 30 Executive rooms with 60m2. All bedrooms are equipped with a 32” flat screen television offering free view channels, iron and ironing board and complimentary tea and coffee making facilities. For business travelers in mind, we provide a desk with a chair and complimentary WI-FI internet access to allow you to work in the comfort of your own room. Your safety and that of your possessions is paramount so each bedroom has a safe large enough to contain a Laptop. All rooms have security locks on the doors and double glazed windows. For increased privacy a resident’s key is required to gain access to the bedroom corridors. Our car park and gardens are also monitored by 24 hour CCTV. The hotel has a limited number of smoking rooms, all subject to availability. After a good night’s sleep there is a choice of Continental or Full English Breakfast Buffet available in the Main Restaurant every day. Ramada Plaza İstanbul Tekstilkent Hotel kindly submit for respectable business partner’s information of our special rate offer for you and your guests. We will be glad to welcome you and your guests here at Ramada Plaza İstanbul Tekstilkent Hotel.